Super Sonic Miracle Wonder Whisk last mixer you’ll ever buy. You can whisk, whip, mix or froth a delicious treat in seconds, making it the perfect addition to your kitchen. 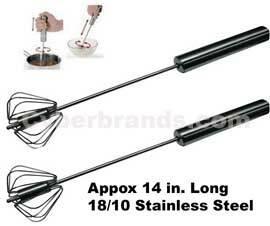 No longer do you have to use large cumbersome equipment or whisk by hand. Pushing the handle up allows you to whisk like a pro, and all without the use of batteries or an electrical outlet. Now you can whisk and whip dozens of incredible dishes with much less time and effort. Push and Mix: Pushing the handle up and down rotates the whisk. by the same moderate upward and downward movement on the handle you can mix like a pro, and all without the use of batteries or and electrical outlet. Stainless Steel Construction: Durable stainless construction for years of enjoyable long lasting use. Care Instructions: Wonder Whisk is dishwasher safe for easy cleanup. Pump it clean in seconds and then toss in the dishwasher, or run under warm water and pat dry. Better Beater does 10 times the work of ordinary whisks. 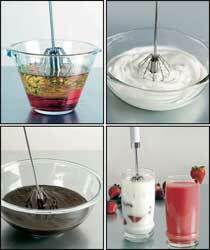 Better Beater mixes, froths, whisks, beats, whips and emulsifies faster, easier, and better than ordinary whisks. The secret is the press and spin action. Save time, energy, and cleanup. Won’t scratch pans and is dishwasher safe. Great for dressings, whip cream, sauces, batters, fluffy eggs, smoothies, frothed milk, and much more. Perfect for people with arthritis.